Olive leaves are processed into capsules, liquids, powders and teas. Read on for benefits of each type and what to look for in a product. Olive leaves are jam packed with plant antioxidants, the amazing broad spectrum antimicrobial oleuropein and its metabolites (broken down products) hydroxytyrosol and elenolic acid. Hydroxytyrosol has a free-radical-scavenging (antioxidant) capacity about ten times that of Green Tea and readily crosses the blood-brain barrier to protect nerve cells in the brain and spine. Elenolic acid is antiviral in action and is the reason for the olive leaf's effectiveness against many viruses. Some of the better known flavonoids are quercetin, which may have certain cancer-preventing properties according to recent research and oleocanthal which has anti-inflammatory and antioxidant properties. Abundant research has gone into discovering what the different flavonoids in olive leaves can do, and thousands of years of use demonstrate their safety and efficacy. While science usually isolates and studies the individual constituents and their properties, it is the combination that produces a unique and multi-faceted interaction with your body. Of the 98 known constituents, oleuropein is used as a measure of the potency of a particular extract. Brought back by Noah's dove, and signalling a new beginning after the flood recorded in the Bible, the olive leaf seems to hold out some sort of hope for nearly everyone. The exciting thing is to discover what it does for you. Olive Leaf capsules contain dried olive leaves, concentrated powdered extracts of olive leaves or a combination of both with or without excipients (explained in the link below). Effective for most uses they do not work as quickly as tinctures nor reach as high a concentration in the blood which is good for stopping the beginnings of an infection in its tracks, but for longer term systemic use and intestinal cleansing they are ideal. More about what to look for in olive leaf capsules. Olive leaf extract liquid comes in ethanolic tinctures and water/glycerine-based liquid extracts. The tinctures are fast acting and ideal for stopping early stages of viral and bacterial infection in the upper respiratory tract and gut. They quickly reach much higher concentrations in the blood than equivalent capsules and are more fully absorbed, so smaller doses can be taken for an effective result. They are also excellent for mouth/dental ulcers and infections and for topical use. The water/glycerin extracts, while usually weaker than tinctures are good general preventative tonics, absorb quickly like tinctures and contain no ethyl alcohol. In high enough dosage are also very effective antimicrobials. Olive leaves may also be supplied in the form of powder or concentrated powdered extracts which can be sprinkled on foods or taken in honey (for children especially) and in as many other ways as your imagination will allow. Their absorption characteristics would be similar to capsules. More about olive leaf powder. Of course a major use of the powder is in capsules, which you can make yourself. in the size and potency you desire. Olive leaf tea is a surprisingly pleasant-tasting beverage with a multitude of benefits. It can easily be made from good quality dried olive leaves from your garden or is readily purchased on the internet. Here are some benefits of olive leaf tea and some instructions on how to make it. The resilience of olive trees is demonstrated by living examples believed to be between 3000 and 5000 years old - and they still produce olives! If the trunk and branches of an olive tree are damaged or die, often new shoots sprout from the roots and it continues to live. 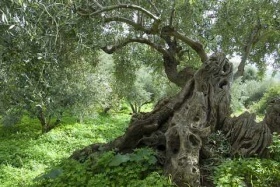 The oldest olive tree is claimed to be in Vouves on the island of Crete (3000-5000 years old). It has an intertwined network of a trunk which makes dating it a challenge. There is also one in Palestine considered by experts to be about the same age. (They are not dated by rings in the trunk as most trees are. The trunks of the old trees seem to be made of a network of smaller "trunks" fed by a common root system). As bible history dates the Flood some 4400 years ago, there is the possibility that some currently existing olive trees pre-dated it. At least one olive tree obviously produced shoots soon after the flood to provide a leaf for the dove to bring to Noah. Could that same tree still be alive, 4400 years later in the area of Mt. Ararat? An even more interesting thought is if an olive tree still bearing olives can be 5000 years old, is it not possible that it lived just another 1000 years before that under the ideal pre-flood atmospheric conditions? If that were the case, it could be an original olive tree created by God's Word on day 3 of Genesis! It may even be smaller than the supposed "oldest ones" by having been partially destroyed and then springing up again. That would make it a special tree. If on a mobile device, to view or add comments click on "Full Site" tab. Have You seen an ancient olive tree? Olive leaves, trees, their fruit and uses are woven into the history of ancient and modern civilisations alike. There is something very special about the olive tree. If you have seen any that captured your imagination, why not tell us about it. If you have a photograph, please include that too.